Budget desktops might not be that exciting or enticing in terms of performance and gaming capacity. But the Lenovo ThinkCentre M700 10GT002SUS Desktop has a few features that give it an edge over other mainstream small form factor desktops. The Lenovo ThinkCentre M700 10GT002SUS is a small-form-factor business desktop made for homes, offices and the casual user’s desks. The one defining character it has is a small footprint capable of fitting snub into small spaces and offices desks. Although it sacrifices expandability and power compared to other desktops in its wake, it still is a great choice for inexpensive PC if you’re looking for a machine to fit your limited- spaced-table. Update: Our unit is out of stock on Amazon. So we recommend the Acer Aspire TC-780-AMZKi5 desktop instead. It offers a great value and has the performance chops you need. 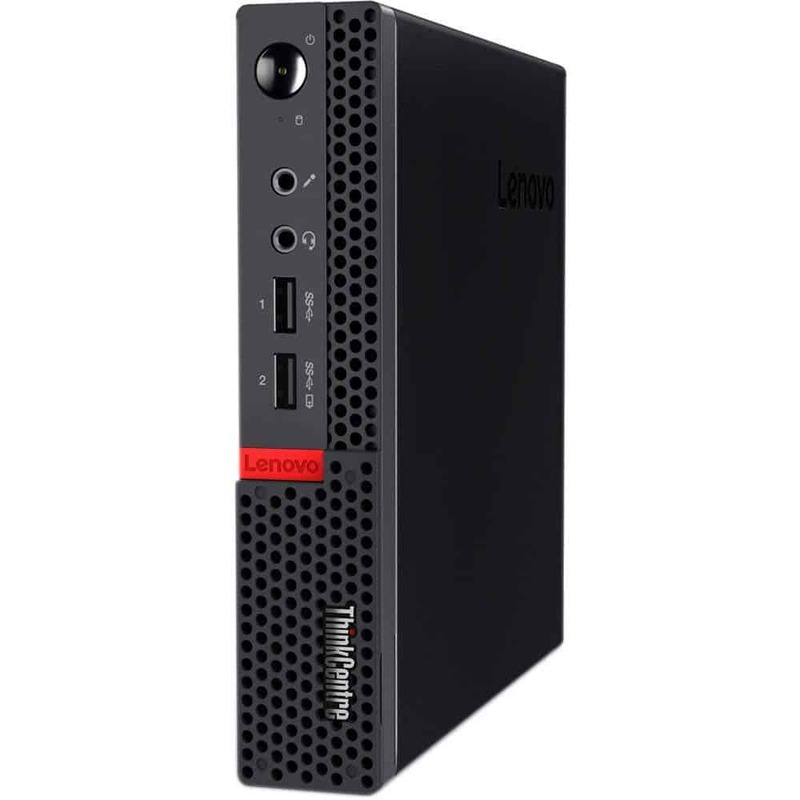 The Lenovo ThinkCentre M700 tiny is a small form factor desktop from Lenovo’s ThinkCentre M700 SFF line of small form factor desktops. The desktop comes in a sleek all-black carbon chassis with no other color save for a small strip of red plastic with the “Lenovo” brand name at the front face, and a silver “ThinkCentre” logo on the lower half section. The first half of the front face is dedicated to the front port system (described below), while the lower to the grills. There is an optional Lenovo Dust Shield and reusable filters offer to go with this small form factor desktop and its various iterations (ThinkCentre M800, M90, and M710). The filters are reliable, easily removable and washable for long-term use. This unit will fit in tight spaces thanks to its small form factor. It measures 21 x 8 x 19 inches a few inches larger than HP’s small factor SFF desktop, the HP L9K23UT#ABA Workstation Z240 Mini Desktop (18.1 x 6.9 x 17.6 inches). The HP Elite Slice is also a small-form-factor business desktop with similar specifications but a smaller and more portable body. It measures 1.4 by 6.5 by 6.5 inches (HWD), a bit smaller in every angle, just as small as the Asus VivoMini VC65-G042Z . There a number of ports for this business desktop. The front houses two USB 3.0 ports (color-coded in blue), two USB 2.0 ports, an SD Card reader slot, two audio jacks and the DVD+RW slot. The power button sits at right at the top corner of this face. The rear sports two USB 3.0 ports, two USB 2.0 ports, a single DisplayPort 1.2, VGA, Serial, LAN, PS/2, and three Audio jacks. Other connectivity options include the 802.11 a/c WLAN + Bluetooth® 4.0. To run point for this system, Lenovo assigned the 2.20 GHz Intel Core i5-6400T (6MB Cache, 2.8 GHz on turbo) processor. This four-core Core i5-6400 rests squarely at the center of Intel’s mainstream desktop processors and it comes with all the required qualities to make a powerful and power-frugal PC. Moving on, for this desktop, Lenovo allocated 1TB Hard Drive storage worth of space which we thought is pretty solid. Of course, you can tweak that 2TB but it’s not exactly necessary, not unless you save a lot of company information there (in form of video). But as far as I know, business PCs require less storage space as their consumer desktop counterparts. This could be especially because employees are less likely to sync their iPad or house their personal video and music album collection. With 1TB, the company can strike a good balance between economy and space. 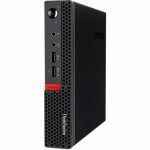 FYI, there is a lower tier configuration with 4GB RAM and 128 GB solid state drive called the Lenovo ThinkCentre M700 Tiny Flagship Edition Desktop. The Lenovo M700 makes its debut with an 8GB SDRAM memory which is a reason for its multitasking prowess. It can handle daily home and office tasks for instance Word processing, video conferencing and web browsing like a charm. The highlight is that the memory size allows for reliable multitasking of all those tasks simultaneously. We’ve seen this same amount of memory before, on the Acer Aspire TC-780-AMZi5 and the Lenovo IdeaCentre 300 desktop . However, if the memory size does not appeal to your better judgment, you can always throw it out and upgrade. There are two DDR4 DIMM memory slots to use while at it, but we reckon you can only go as far as 32GB max (which would be overkill) – 16GB on each. As usual, you will find low-power graphics card on low-cost desktops and the ThinkCentre didn’t fall too far away from the tree. To power this desktop, there is the modest Intel HD 530 graphics card. It isn’t exactly a gaming card hence don’t expect to be secretly playing some recent titles behind your office desk. Some 2017 games play but at a completely low altitude. Expect 20 fps at best if you really have to try. For instance, For Honor 2017 managed 23.8 fps on low 1280 x 720 settings while Ghost Reckon Wildlands 2017 a whopping 13.3 fps on the same setting. Gaming aside, external displays can be connected via DisplayPort 1.2/1.3 with a max resolution of 3840 x 2160 @ 60 Hz, while HDMI connections running on 1.4a versions (older) link, but on max resolution of 3840 x 2160 @ 30 Hz. If you own a newer monitor using HDMI 2.0, you will have to buy a DisplayPort to HDMI converter to handle that. The GPU supports up to three monitors simultaneously enabling you to maximize productivity. (VGA, DVI, and DisplayPort). The Lenovo ThinkCentre M700 tower is powered by a low profile 210-watts power supply unit (PSU). This might sound a little low but it is sufficient for low powered office and home use. On a broader scale though, it is much lower than the Lenovo IdeaCentre 300 desktop’s and Acer Aspire ATC-780-AMZi5 desktop’s 300-watts. But it’s slightly at par with Lenovo 10KY002BUS S510 SFF desktop (180-watts). This unit marks the one way to acquire an inexpensive alternative for business desktops without sacrificing much in the way of cash. While the choice of this ThinkCentre desktop means you’re sacrificing expandability and power, the highlight is that you’re getting a more compact and portable device that you can hide behind your HDTV. It’s in the same league with the Lenovo 10KY002BUS S510 SFF desktop and Lenovo ThinkCentre E73 10AU00EUUS Desktop, but the larger form factor Acer Aspire TC-780-AMZKi5 desktop and Lenovo IdeaCentre 300 desktop offer better value for the price. Even so, if you’re looking for a small footprint desktop, the Lenovo M700 Tower is a good choice worth looking at. Buy the Lenovo ThinkCentre M700 10GT002SUS from Amazon. Update: Our unit went out of stock on Amazon. Check out the Acer Aspire TC-780-AMZKi5 desktop instead. It makes a great replacement as well.